Both belief discrepancy and political tolerance reviewed earlier help us to understand specific aspects of tolerance. What this research does not cover is tolerance to human diversity more generally, its developmental trajectory, and how it is conceptualised with particular emphasis on reasoning, judgements and justifications. 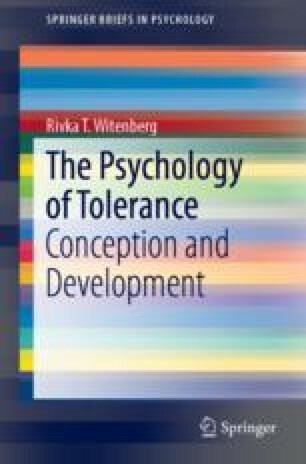 As discussed in the introductory chapter, the starting point for this research was the assumption that tolerance to human diversity is not simply the absence of prejudice but that it is a separate construct best placed within the moral domain and which is worth serious consideration from a psycho-developmental perspective. Several studies were conducted in Australia and one in Israel using the method described in Chap. 1 in order to better understand how contextual factors of story contents and the behavioural dimensions of beliefs, speech and acts influenced tolerance in participants beyond the age of seven. How age- and gender-related differences affected the conceptualisation and development of tolerance was also examined.